The combination of almonds in a soft cake-like filling encased in pastry is such a winner. A baked almond tart is straightforward to make yet creates a classic in taste and in the French kitchen. 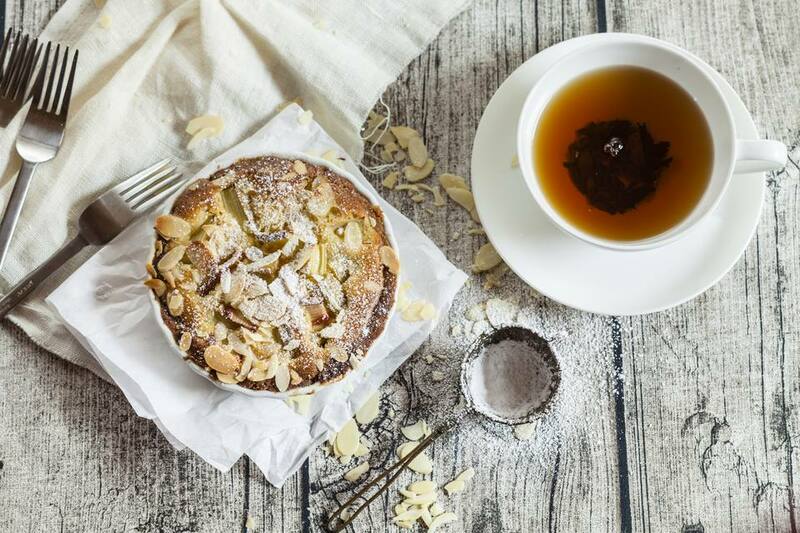 This almond tart recipe makes a caramelized, delicately crunchy tea time treat and with a dollop of fresh or Chantilly cream served turns this into a winning dessert. There are many variations of this dessert, especially a Tarte aux Pommes which includes apples. In a small bowl, mix together the flour, sugar, and salt. Using a pastry cutter, large-tined fork, or a food processor on pulse setting, cut the chilled butter into the flour until it resembles coarse sand with a few pea-sized pieces of butter still visible. Sprinkle the cold water onto the mixture and toss gently a few times, just until it forms a ball that holds together. Separate the dough into two balls, flatten slightly into thick disk shapes, wrap in plastic wrap, and chill for several hours before working with it. Preheat an oven to 375F. Roll and trim the dough to make a circle large enough to fit a 10-inch fluted tart pan. Fit the circle into the bottom and up the sides of the pan. Line the line the dough with pie weights or dried beans and bake it for 15 minutes. Remove the pie weights and bake the shell for an additional 5 minutes. Set aside the pastry shell, still in the tart pan, to cool. In a medium saucepan set over low-medium heat, stir together the cream and sugar until the sugar has completely dissolved. Remove the pan from the heat and stir in the salt, vanilla extract, almond extract, and almond liquor. Once the flavorings are incorporated, stir in the sliced almonds combined. Pour the warm almond filling into the prepared pastry and bake it for 30 to 35 minutes until it turns golden brown and the filling is set. Allow the tart to cool in the pan on a wire rack for 15 minutes. Serve at room temperature, or chill in the refrigerator before serving. Serve with a good ice cream or cream as above.